For the past week, the world has been captivated by the passing of Nelson Mandela. He is being remembered as a man who risked his life for others. As someone who used his voice to speak for the outcast and marginalized. As a man who overcame great odds to lead a nation. He will forever be a figure of peace and reconciliation in our world. 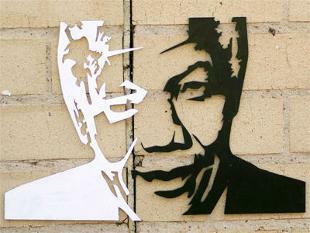 Mandela’s story is one with many twists and turns. And while our final images of him are peaceful, the progress he sought in his nation did not come easily. Growing up an oppressive South Africa, he was early on an advocate for non-violent social reform. But frustration with obstacles led him to soon consider less peaceful means, such as sabotage and guerrilla warfare. This eventually lead to his imprisonment where, as we know, his life began a drastic change. Once released, Mandela became the healer of a nation. He invited and included his oppressors instead of subverting them. He led through a message of reconciliation and hope. This is the Mandela the world fell in love with. But even though his means were no longer violent, his struggle to fight the oppressive forces in his country could be described as nothing short of a fight. We revere him for his commitment to peace and love in the face of hate and tyranny. The pursuit of peace does not always feel peaceful. This is a lesson I learned early in my life. Growing up in a military family, I was quite aware of the cost of peace. My father served in the Air Force 24 years and still works on base as a civil servant. My grandfather served the Army through conflicts. My brother-in-law is currently overseas putting his life in harm’s way with the Navy as a private contractor. I have seen first hand the sacrifices and struggle that peace requires. Freedom is not free and peace is not always found peacefully. Scripture tells a similar story. The entry of Christ into the world is full of struggle and violence. It’s the story of a man laboring to protect his pregnant wife from public scorn. Of a baby born in a barn. Of a crazed “king” slaughtering babies in a wild attempt to protect his throne from this child-king. The Christmas story is not very peaceful on its face. Advent is a call to examine our lives and make room for peace. But this will never be a smooth or easy process. It may not be a fight like Mandela or the military, but it is a fight nonetheless. Do you have takers in your life – people that only drain your energy without giving back? Are there habits or activities that distract you from more excellent things? Are there attitudes that keep you from really loving others around you? Is fear holding you back from chasing your dreams and goals? These issues do not resolve themselves. They must be met head on and confronted. And sometimes that looks more like violence than peace. But true peace does not come through avoidance, but is rather found on the other side of struggle. So during this week, may we hear the call of Advent to look into the corners of our lives. May we have the courage to confront the attitudes and actions and even people that stand in the way of peace. And may we fight for peace so that it may reign more fully. Because peace is something worth fighting for. Wow. Thank you so much for those kind words. You are definitely missed as well! !